Preventing unauthorized access to Web API controller actions and applying a centralized security access, seems to be a tough and complicated task for many web developers. More over, there are many players entered into the game latetly, such as ASP.NET Identity or OWIN middleware and things can get pretty messed up if any of these concepts are not well understood. This is the last part of the 3 Part Series about integrating Web API and AngularJS. What we have seen till now on the first and second post, is how to setup an MVC web application project work with AngularJS as the front-end and a Web API layer as the service layer. Second post’s objective was enabling Session State in to the Web API layer so that users don’t loose cart’s data at page refreshes. What we left undone though, is securing our application from unauthorized access which in our case that would be preventing unathenticated users from creating gadget orders. I ‘ll start adding new functionality to the GadgetStore project so in case you want to follow with me, you can download it from here. Let’s start! I will break the Security integration into the following 3 parts starting from bottom to top. In our GadgetStore application we do use Entity Framework for database access but we don’t have any membership related Entities yet. In order to make Entity Framework act as the storage system of ASP.NET Identity we need to make use of two specific classes: IdentityUser and UserManager. Then we ‘ll change our StoreContext to inherit IdentityDbContext<IdentityUser> instead of simple DbContext. Mind that you don’t have to use the exact implementations of IdentityUser and UserManager as are, but you can create your own classes that derive from these two respectively. This is actually what we are gonna do right now. 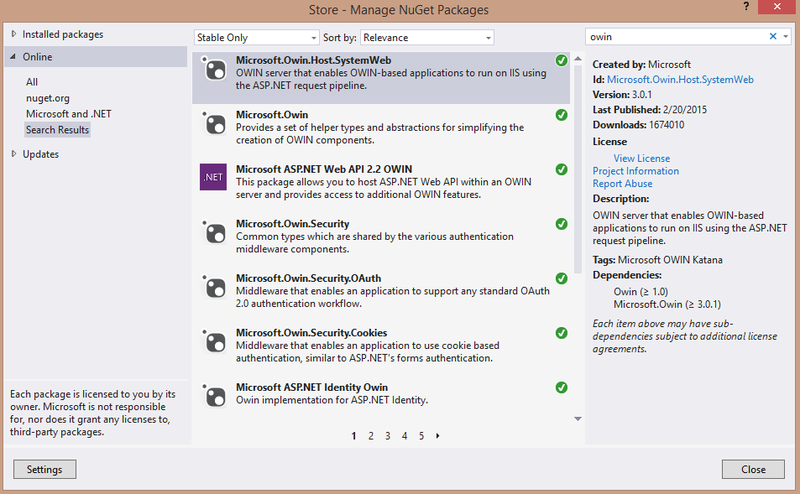 Starting from the Domain class library project install Microsoft ASP.NET Identity EntityFramework package using Nuget Packages. This will also install Microsoft ASP.NET Identity Core as follow. Add an AppStoreUser class file and paste the following code. 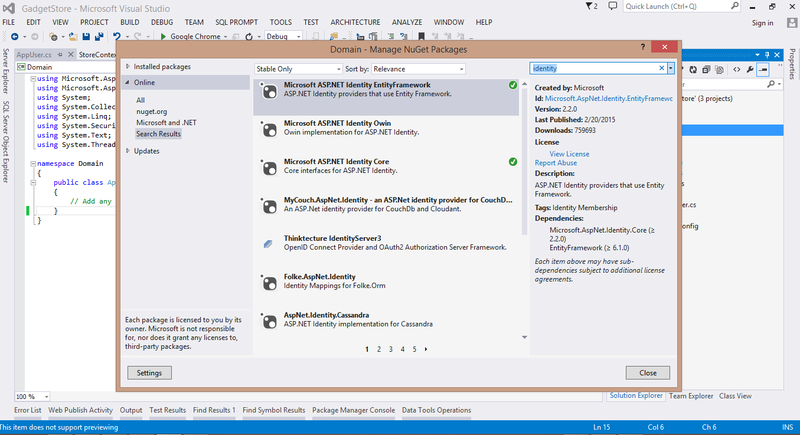 Now switch to DataAccess class library project and install ASP.NET Identity Entity Framework package as well. UserIdentity class may have a special meaning for Entity Framework but that doesn’t mean it cannot have it’s own configuration. If you remember, we had a folder named Configurations inside this project, where we put all our Entity Framework Configurations. Let’s make the same for the previous class we added. Add a class named AppStoreUserConfiguration inside the configurations folder. The most important change to notice is that StoreContext class inherits IdentityDbContext and not DbContext anymore. Now let’s create the class that will inherit UserManager<T> where T is a UserIdentity class. We will place this class inside the Infrastructure folder in the Web project named Store. This means that you have to install ASP.NET Identity EntityFramework package in this project as well. This class can be used to manage AppStoreUser instances, that is create, modify or even delete user entities. It isn’t though limited only to Entity Framework operations as will we ‘ll see later on this post. If I were to describe what OWIN Middleware is, I would say that middleware is a black box of specific services that an application requires. In other words, you setup an OWIN middleware by selecting individual services you want to use and the specific provider for those services. In our case, we will use OWIN to enable Bearer Token Authentication in our application. The key point to understand here, is that OWIN raises it’s own events when a request arrives. When those events are raised, all respective providers will also respond respectively. Is the Store applicaton we will plug an OAuthAuthorizationServerProvider which will be called from OWIN middleware everytime a user tries to create an access token. Assuming you have all the prementioned packages installed, add a Startup.cs file at the root of the Store application. In the App_Start folder add another file named Startup.cs. We want our application to use Bearer Token Authentication so we set a relative provider (not implemented yet). Anyone wants to create an access token will have to post it’s credentials on /Token URI. Let’s continue by adding two required methods into the AppStoreUserManager class. We need to add an implementation class of the OAuthAuthorizationServerProvider which will be used to grand access to Web API resources (Action methods). Inside the infrastructure folder add the following ApplicationOAuthProvider class. When a user tries to login, he ‘ll post his credentials to /Token URI (not to some Login action). 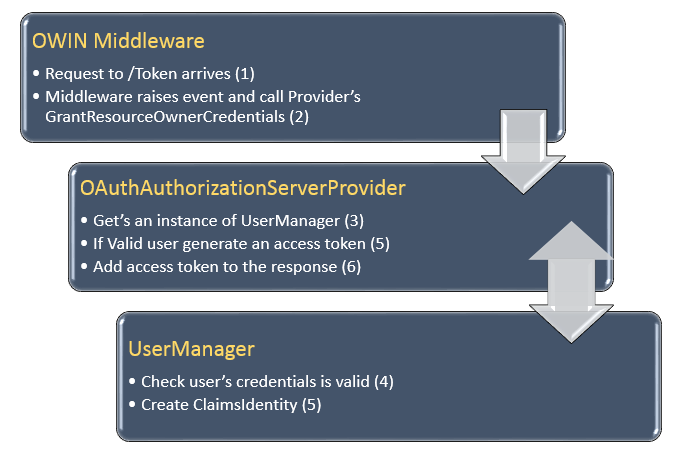 OWIN middleware will raise an event and will call GrantResourceOwnerCredentials of the provider. If the credentials are valid then an access token will be created and added to the response. All requests trying to access a protected resource, must provide this generated access token. 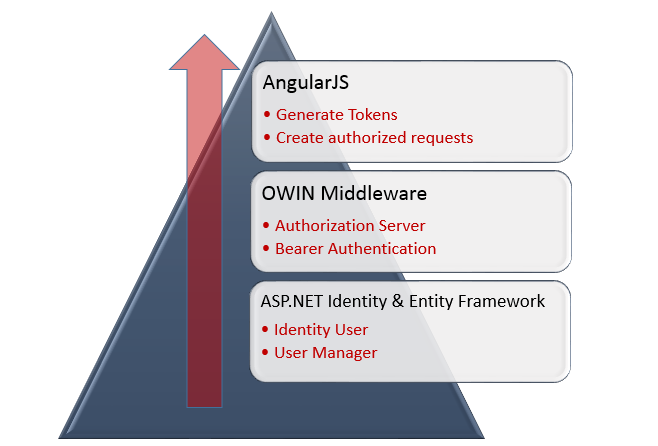 You can now understand that the provider is the glue between the OWIN Middleware and ASP.NET Identity. The HostAuthenticationFilter is responsible to authenticate users based on the access token found inside the request. If no token found then the user is considered as unauthenticated and cannot access protected resources. Before moving to the AngularJS Level, let’s restrict access to the OrdersController Web API Controller by adding an Authorize at the class level. We will need an AccountController that users can use to register new accounts. Add it inside the Controllers folder. If you run your application and try to create an order, you will get an unauthorized error since we restricted the access to the orders controller. We need to change two things in the angularjs $scope.sendOrder functions, which resides inside the gadgetsStore.js file. Let me also remind you that this file also defines the root controller gadgetsStoreCtrl of our AngularJS application. At the same file we need two more methods: A $scope.logout function which simply removes the access token and hence the user get unauthenticated and the $scope.createAccount which redirects the user to a register template. Redirection to /login and /register locations won’t do anything if we don’t tell so. In the mainApp.js file add the highlighted lines. Following are the login.html and register.html template views. Open the cartDetails.html and add the highlighted line so that user can logout when is already signed in. Build and run your application. Try to create an order and you will be redirected to the login page. Click the register button to and reate an account. You will be redirected to login page. Enter your credentials and continue with your order. You can create orders till you press the logout button. Click here to see it in action (you may required to refresh the page when the tab opens). I am really happy that these Web API feat. AngularJS series have come to an end cause we had the opportunity to see a lot of features concerning both Web API and AngularJS. Now that we have a project like this, we can focus more on individual concepts such as Web API Security or AngularJS project structure best practices. There are so many things we added this time and I hope I have mentioned all of these in the post. If you have problems running your application you can always download the tested and updated version from here. Make sure you get subscribed and get notified for newer posts! I believe it’s much cleaner now. Thank you very much for these series sir. Very nice work. really i got idea and knowledge using web api token base security. How to customize authentication to my own set of tables in asp.net web api 2. Chris here i want to use my own database schema instead of apsnet identity database. how i can achieve this. because owin creating own schema apsnetUsers,aspnetRoles etc but i want my own database. This is simply one of the best (maybe even the best) series on “MVC and AngularJS”. Great quality work!! Hello, bearer tokens enough secure? Any attacker can steal access token on my browser’s local storage can be authorized automatically on their own browser. Maybe you will say use short life access token. But I think this also not quarenteed method. What do you think about that? How can i do that ?! !